If you'd like to send and receive e-mail but don't want to bother learning about or paying for a computer, the MailBug may be perfect for you. With the MailBug, checking your e-mail is a easy as pressing a single button. 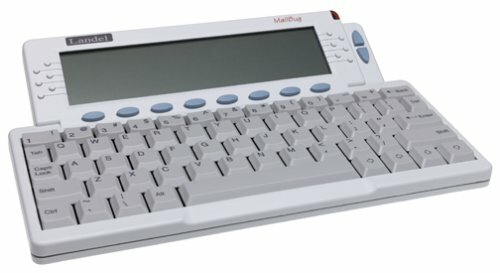 The MailBug has 61 main keys, 8 function keys above the main keyboard, and 12 menu buttons next to the LCD screen. Typing on the full-size keyboard is fast and easy. The Shift keys and functions keys are conveniently placed and all the keys were responsive and comfortable as we typed our messages. While browsing the onscreen menus, we discovered the Services function, which let us view headline news and look up stock quotes. We also located the built-in phone book, which allowed us to create and save names and phone numbers. The entire process was straightforward and intuitive. Additional features include an e-mail address book and caller ID with a 100-call history and automatic "display and dial." A status LED blinks rapidly to indicate that the phone is ringing and blinks slowly to indicate new caller-ID calls or voice-mail messages. (A subscription to caller ID and voice mail is optional through your phone company.) The documentation, which is easy for novice users to understand, completely explains how to compose, send, receive, and manage e-mail. If you don't want a PC but you do want to send and receive e-mail, the MailBug from Landel Telecom is an easy-to-use alternative. We bought the mailbug for my in-laws, who are in their 60's and have never been comfortable with computers. In order to make it look especially simple, we set up their account before we gave it to them, and found this to be an easy process. At one point we had to call the help line and the person who helped us was very nice - you could tell they were used to helping people without any computer experience. When my in-laws opened this gift they were skeptical about being able to use it, but within 5 minutes of plugging it in they had sent their very first email. Now they love it and use it almost every day. I am going to buy this clever gadget the first thing next month for my old folks. Only clarification I need is whether I have the freedom of choice for any ISP. And yes, the main thing is that I am living in Singapore. Anyone who can direct me to the nearest store which sells this practical item in Singapore??? This is by far the best e-mail internet appliance on the market. Simple, user-friendly device. I highly recommend it to anyone who wants to keep up with family and friends via e-mail and not have to wrestle with a computer. I already have an ISP. Is it possible to reconfigure the mail settings (POP3, SMTP, ISP login & pw) for the Mailbug and NOT have to pay an additional monthly fee ? Or must you pay an additional monthly fee for a 2nd (redundant) service ? I know that the Mailbug's competition (Earthlink's MAILSTATION) does not allow you to change these settings even though there is a menu in the details section for it. Earthlink's Mailstation won't allow to reconfigure its settings for another ISP, but does Mailbug allow it (so I don't have to pay any monthly fees associated with it) ? Piece of junk, don't buy!!! I bought this appliance for my grandmother, who was terrified of computers. We thought it would be a wonderful way for her to be able to keep in touch without the fear involved in a big computer setup. The day after I set it up for her, it erased all the previously stored data. The next day it told her that memory was full and she must erase messages, even though she didn't have any. Landel tech support wasn't any help, as whenever we called them it became quickly apparent that anyone who read the manual knew more about the Mailbug than their own employees. After these first two snafu's, it would work for a while, and then erase all stored information at a rate of about once a month. While this may be just a minor inconvenience to people used to computers and email, for my grandmother it meant a total standstill in communication and complete frustration. She would have to wait for a more tech-savvy member of the family to come out and set up the stupid machine again. Finally, today, after having owned the machine for a whopping 9 months, the modem inexplicably "blew out" and the machine is officially dead. What a waste of time and money it turned out to be. It is also worth noting that the price of the monthly service was not the $8.95 advertised, but jumped to $12.90 because even though my grandmother lived in a major metropolitan area, Landel told me there were no local calling numbers, so we had to use an 800-number and pay a surcharge for that privilege. This would be a great little device if it did what it said it would. But it doesn't. Skip it and buy a basic computer with a cheap, reputable internet provider like AOL or NetZero.